With it being the holiday season and all, despite Tottenham being in complete and utter turmoil, I have to admit I’m still feeling the holiday spirit. I know not all of my fellow Spurs supporters are feeling so festive, the gloom dimming all of the bright holiday lights. So I thought I’d do something to help improve the mood. 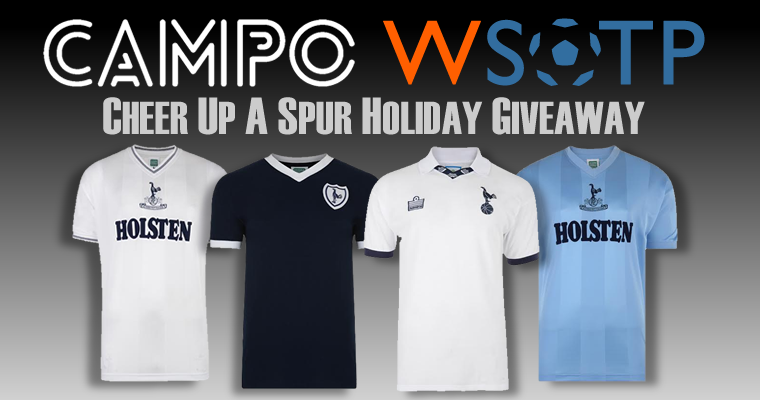 WSOTP has teamed up with retro-kit makers Campo Retro to offer Spurs supporters the world-over an opportunity to win a free customized retro Tottenham Hotspur shirt! Whether you want to Ossie Ardilles shirt from 1978, a 1983 Glen Hoddle shirt or a shirt of your choosing with your own name across the back, this is your chance to take home some old school Spurs’ threads for free! Campo Retro has a wide range of Spurs retro shirts available among their collection of classic shirts and track jackets ranging back from 1962 to 1991 for a wide variety of clubs and national teams. And unlike some of my prior competitions on WSOTP, there is no geographic restriction for this giveaway. So whether you’re a local lad in North London, an Australian supporter down under or if you’re American Spur like myself, you should absolutely throw your name into the hat. So, how does one throw their name into the hat? Who is Tottenham Hotspur FC’s all-time leading goal scorer? See, I told you it was simple. And even if you don’t win, Campo Retro will still send you an exclusive discount on any of their excellent retro apparel… so it’s worth it either way, right? Just remember to send Campo Retro your email response by end of day January 27th. And while you’re at it, don’t forget to give WSOTP a follow on Twitter and Facebook as well as the same for our friends Campo Retro’s Twitter and Facebook pages, too. So chin up fellow Lillywhites… the Christmas fixtures needn’t be so glum after all!